Johnny Otis started his musical career in 1939 as a drummer with Count Otis Matthews' West Oakland Houserockers. From there he went on to play drums for the bands of Harlen Lenoard, Bardu Ali, Lloyd Hunter, George Morrison, and Robert Johnson. He formed his first big band at the Club Alabam in Los Angeles in the mid-forties. He and I had been friends since we were kids, and I became his stage and transportation manager. I worked and traveled with him for many years, and we have remained the best of friends to this day. His first hit record in 1945, "Harlem Nocturne," established him as a big name in Black show business, and marked the beginning of a long and successful career in the entertainment world. In 1948 Johnny joined the Bardu and Tila Ali, and Johnny Miller to open the Barrelhouse, which was the first Rhythm and Blues Club in Los Angeles. It was here that many R&B artists got their start, including Little Esther Phillips, the Robins, and Mel Walker; artists that Johnny discovered and featured as vocalists in the club. In 1950 Johnny's composition "Double Crossing Blues," featuring Little Esther and the Robins, held the No. 1 spot on Billboard magazine's Best Selling Retail Rhythm & Blues Records list for nine weeks. That same year he had nine other Top 10 R&B hits. He was quickly becoming one of the most popular musical attractions in Black America, so he put together the California Rhythm & Blues Caravan featuring Little Esther and Mel Walker, and they began touring across the country. During the early '50s, Johnny discovered such performers as Jackie Wilson, Linda Hopkins, Little Willie John, the Royals (later to become Hank Ballard & the Midnighters), ands Sugar Pie DeSanto. Also in the '50s, he discovered Willie Mae "Big Mama" Thornton and Etta James, both were featured vocalists in his band. In the early 1950s, while remaining active as a writer, performer, and producer, Johnny began a radio career and became one of the most popular disc jockeys in southern California. His career in radio has spanned almost 50 years. He is presently heard on KPFA, KPFB, and KFCF in northern and central California. His success on the radio led to a weekly television variety show in Los Angeles. 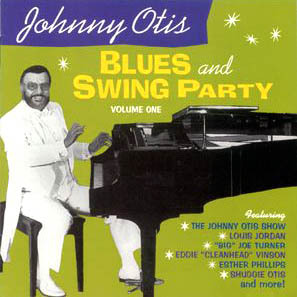 The Johnny Otis Show was on the air for seven years. In 1955 he started Dig Records. He recorded his own band as well as many other artists until he signed with Capital in 1957. In the years that followed, Johnny continued to perform and put out records. Two of his recordings, "The New Johnny Otis Show" (1981), and "Spirit of the Black Territory Bands"(1992), were each nominated for a Grammy. In this album, you will hear some of Johnny's earlier recordings with great R&B pioneers such as Little Esther Phillips, Joe Liggins, Eddie "Cleanhead" Vinson, Joe Turner, Richard Berry, and Louis Jordan. Also included are a number of selections from the vaults of Dig Records, including "Old Folks Boogie," which Johnny recorded on a "hunch" the first time Al SImmons (with Slim Green) and the Cats From Fresno played for him. "Misery" is taken from a 1970 television special in Los Angeles that recreated a night with Johnny at the Barrelhouse Club. You will find some of his most recent work as well, including songs by vocalists Barbara Morrison and Charles Williams, who were discovered by Johnny and spent many years as featured vocalists in his band. Johnny laughs when he is referred to as a singer, explaining that he sings the blues for fun and doesn't take himself seriously. Nevertheless, his singing "for fun" has produced numerous hit records; the best known, "Willie and the Hand Jive," has sold millions of records. In addition to Hand Jive, Johnny has written many successful songs including "Every Beat of My Heart," "So Fine," and "Dance With Me Henry." Johnny has been inducted into the Rhythm & Blues Hall of Fame, and into the Rock & Roll Hall of Fame. Today he teaches a course at the University of California in Berkeley, titled "Jazz, Blues, and Popular Music in American Culture with an emphasis on African American musical artistry." His current band represents three generations of the Otis Family. Performing with Johnny is his son Nicky on drums, and his grandson Lucky on bass. His son Shuggie can be heard playing a number of instruments including bass, guitar, piano, and organ throughout this album. Johnny has always affectionately referred to Shuggie as his musical right hand man. Since his first hit record Johnny has been a moving force in the world of popular Black American music. His influence cuts through a broad spectrum of styles- Jazz, Blues, R&B, Rock and Roll, and Soul, but he is best known for his contributions in the development of Rhythm & Blues, the idiom that gave birth to Rock & Roll. Johnny's hallmark has been artistic integrity laced with plenty of entertaining fun. It is this combination that has helped make Johnny Otis a legend in his own time. William Avant passed away just before this record was released. This CD is dedicated to his memory.